Product prices and availability are accurate as of 2019-04-03 18:56:57 EDT and are subject to change. Any price and availability information displayed on http://www.amazon.com/ at the time of purchase will apply to the purchase of this product. 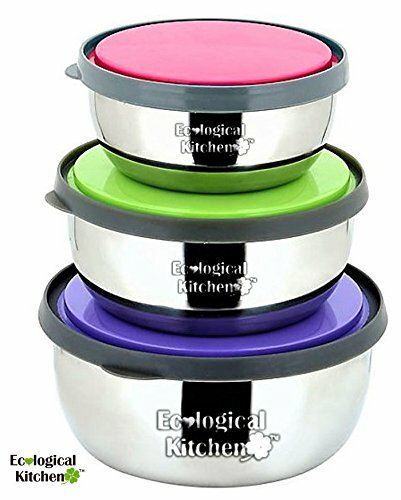 We, at ECOLOGICAL KITCHEN, care about protecting the family and your children. Therefore, we choose high-quality, stainless-steel dishes that last longer and reduce environmental pollution. Our storage dishes are nesting, suitable for storing fruit, sandwiches, cereal, leftovers and other food. They keep food fresh and safe. 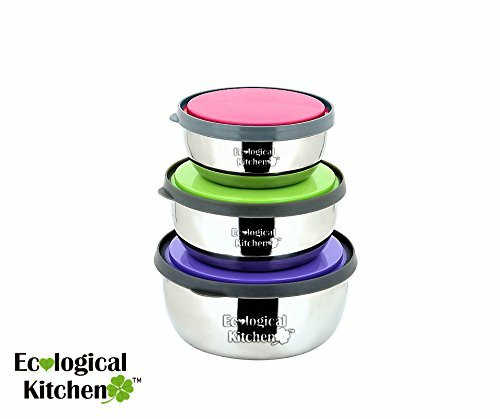 These dishes are high-quality and safe; suitable for daily use by both adults and children and they are non-toxic (BPA FREE) and maintain hygiene by easy washing. 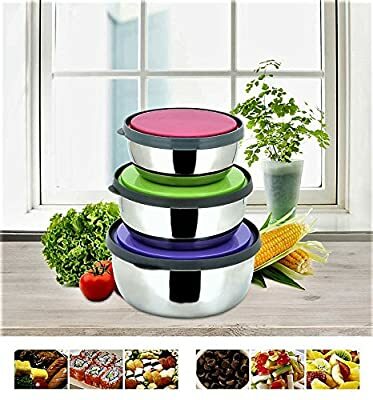 The dishes are very easy to store and can be stored with leftover food from dinner without having to replace the serving dish, allowing easy use, quick serving and saving dishwashing time. The dishes are also beautifully designed and respectable so that it can be used as a dish for serving guests. Our products do not accumulate dirt and grease and are easily washable and dishwasher safe. You can take them to work, school, on vacation, camping, outside with the baby and use at home. Easy opening for both adults and children. Our company specializes on making life more comfortable while protecting the environment. 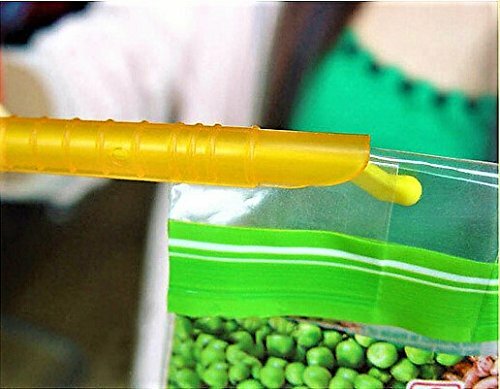 Attached with the Stainless steel food storage container a FREE bonus: 4 Plastic Bag-Sealer Clip Sticks (12cm). These sticks seal bags and keeping food or chips fresh over longer periods of time by sealing out air or liquids. Enjoy a healthier lifestyle. Click now on "add to cart" and enjoy this beautiful quality product that will stay well preserved over a long period of time and get a bonus gift product. THREE PRODUCTS IN ONE PACKAGE - from now on, fit the size of the container to your individual needs: Do you have leftover dinner? Now you can pack the leftovers in a container that fits the quantity that is left without taking up extra refrigerator space. 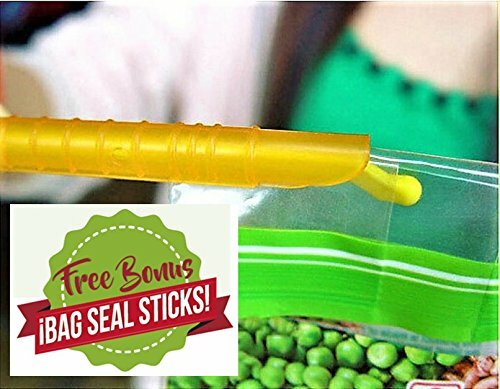 Free bonus - storage sticks - seal closed bags of snacks / legumes / cereal, etc. With the combination of these two food storage products, storing your food will be easier and less time-consuming. GREEN AND HEALTHY - Switch over to healthier, long-lasting containers that protect the health of our children and get rid of "single-use containers" for storage. The container is non-toxic and BPA FREE LONG-TERM STORAGE - Leave the old plastic storage boxes that easily break and get stuck with oil & dirt and move to sleak and shiny stainless-steel storage containers. They are durable and maintain hygiene by being easy to clean and dishwasher safe. 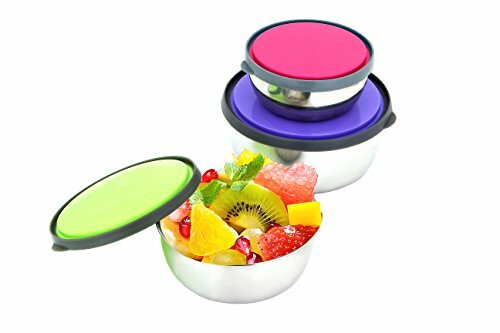 EASY OPENING FOR CHILDREN - Suitable for sandwiches, leftovers, snacks and sliced fruits to send with your children without worrying that they will not be able to open the container. DESIGNED CONTAINERS- Can be served directly from the refrigerator to the table without having to transfer to a serving dish. At the end of the meal, just easily close the container with the lid and return it back to the refrigerator. MONEY BACK GUARANTEE!